If North India lights up its homes on Diwali to welcome Lord Rama, in Tamilnadu, the honour is reserved for its beloved son, Karthikeya. While lamps are indeed lit during Diwali, it is during November/ December that the towns and cities light up for Karthikai, welcoming the son of Shiva and Parvati. Out come the old brass lamps, the closely guarded silver ones, and beautiful clay ones, all signifying the triumph of good over evil, showing the path ahead to a happy and prosperous life. Taking pride of place amidst these is the Kuthu Vilakku – the traditional lamp of this region, usually made of brass, but sometimes of silver. These are presented to a daughter at the time of her marriage, and are regarded as family heirlooms. Typically, they stand on a base, with a long, thin stem, and the lamp on top. The lamp traditionally has space for 5 wicks, and oil is poured in the centre for lighting. Rising from the centre is a decorative element – sometimes a simple pattern, and sometimes, an Annapakshi – a mythical bird between a swan and peacock. It is said that the design originates from the ancient system of a lamp with a pointed stem which was fixed to the ground in homes and temples, also giving it its name. The Kuthu Vilakku is of many types, usually depending on the area of origin. Each part of Tamilnadu has its own special type of lamp, and the design clearly proclaims its origin! For example, on the Tamilnadu Kerala border areas, and in Kerala itself, the Kuthu Vilakku traditionally has a thicker stem, which can either be smooth or ribbed, and the lamp portion itself isn’t separated for wicks. There is just one hollow area, and wicks can be placed anywhere. There is no decoration on top either, just a smooth spire. Lamps from the Tirunelveli district have their own distinct style too with the shape of the stem and the pointed spire. Besides the Kuthu Vilakku, there are also what are called the Kamakshi vilakkus. These are flat, with space for one flame on a base, with the image of the goddess Kamakshi (and at times, other goddesses, like forms of Lakshmi) behind. These are used regularly for the daily prayers at homes. There are many types of these flat lamps…. Such as the Aikya Vilakku (again from Tirunelveli) where the pattern represents the divine trinity – Brahma at the base, Shiva on the triangular portion behind and Vishnu represented with the naamam or three vertical lines. Then, there is the Kubera Vilakku, used for propitiating the Lord of Wealth, which is surprisingly simple, with no decoration at all! Amongst other kinds, there is the Paavai Vilakku, which shows a woman holding a lamp. We see these most often in temples, though used at homes too, these days. Some of the ancient lamps of this kind, are almost life size, with amazing details of the woman, her clothing and ornaments! There are newer versions of ancient lamps, usually found in temples, such as the ‘Gaja Vilakku’ or elephant lamp, with the elephant carrying the lamp on its back. And this small Kuttu Vilakku, which has a container over the hollow, in which oil is poured, and from which oil keeps dripping into the hollow, keeping the wick lit for a long time. Most of us are familiar with the clay lamps or diyas we buy for Diwali. We Tamils also have a brass version, once again, used for Karthikai, and gifted to the daughter at her wedding. They are usually shallow, but when lit, are the perfect companions to the gleaming Kuttu Vilakkus and Kamakshi Vilakkus! When you think of traditional lamps in Maharashtra, the first thing that comes to mind is the Laman Diva, or hanging lamp. This lamp hangs over the puja area in the home, its flame twinkling like a star, giving it its name. Traditionally made of brass, it is also made of silver, and these days, comes in different patterns and sizes. Then, there are the tall, stemmed lamps, similar to the South Indian Kuttu Vilakku, but with a slightly different pattern. 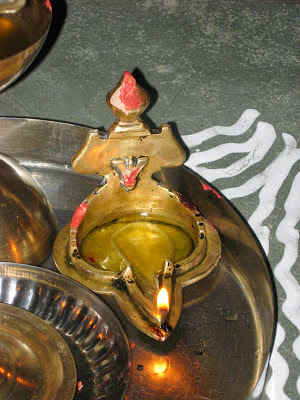 The most variety is seen in the lamps used for Aarti. There are shallow ones, and deep ones, patterned ones, simple ones, and there are lamps with a sort of funnel for the wick to go through. 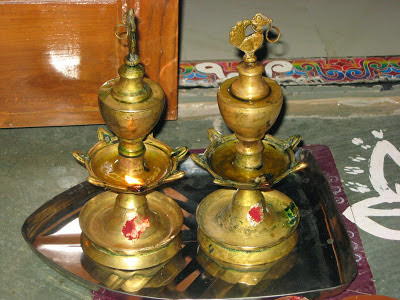 The lamps for aarti are often a pair, placed on a plate, ready to be used for the prayers. These could be brass, or even silver. However, the most fascinating among the lamps of Maharashtra are those seen in temples. Huge ones with a bulbous container for oil hang from the ceiling, oil dripping on the wick, so the flame is lit for a long long time. Smaller versions are also available these days, and used in homes too. And then there are the step lamps, inspired by the huge deepstambhs (lamp pillars) seen in temples. The temple ones are usually in stone, with hollows for the lamps in layers. The smaller versions are usually brass, and have multiple layers for lighting lamps in. Today, there are even more types of lamps available…. Of different patterns, and with glass cases designed to protect the flame from the wind, or brass cases with patterned holes, which serve the dual purpose of allowing a bit of air to pass through, as well form interesting patterns around! A version of this article appeared as part of a series on Diwali, in the October 2014 issue of Rail Bandhu, the official magazine of Indian Railways. The photographs are all my own, and some of them accompanied the article in the magazine. Special thanks to my aunt, Mrs. Vijaya Srinivasan, for all her help with the different types of lamps, especially the Maharashtrian ones. How many articles are there in that series? Thank you so much, Nisha! The series had bits from various states - about 10 in all. Very informative! Such a variety of lamps to celebrate in different ways, all beautiful! The silver aarti in your story drew my eye the most since they look like flowers. Is it a thrill to open up a publication and see your story and photos? Thank you so much, Natalie! yes, the lamps do look like flowers.. and actually I have some more which actually resemble flowers even more! will post photos some time... and yes, its really a thrill to open a mag and see my work!!! An amazing post! My mom's Tamil, so I've seen many of these lamps at home and at my grandmother's place, but I never noticed the details so carefully as they have been brought out in your post. The gaja vilakku and paavai vilakku are gorgeous! sorry Charu! the comment was awaiting moderation, and since I was online only through the mob, i missed it :( have approved it now..